Sorry that a month has passed since the con. I'm been busy with other stuff (and my mind has been focused on other things), and while I've had the report finished for days, I didn't really remember to post it until now. After 19 years in Baltimore (with me attending the con the last sixteen of those years), Otakon made the big move this year to its new home at the Washington Convention Center right in the nation's capital. While there's definitely a few people who would wait until next year before checking out the new home of Otakon (understandable when you consider how messy it is to get to conventions taking place right in the middle of DC), as someone who usually passes the convention center when I travel to and from Anime USA each year, I wasn't going to let that affect my annual summer vacation. As such, a few weeks ago, I attended this year's Otakon. In the weeks leading up to the convention, there were a few things that concerned me. First, the schedule came out some time before the con, and it was revealed that due to the con only having two "big size" rooms (with priority being given to special screenings of movies and the Anisong concerts), one of my main Friday events, the AMV Contest (which was a big deal for me this year, as you'll see later), was happening at 1:00 PM and thus messed up my usual early Friday afternoon tradition of checking out the Dealers Room. While I didn't mind holding off any major spending until after the contest, there was still the issue of trying to balance both that and my main shopping priority of this year's Otakon shirt. Thankfully, I was able to get both them done without too much of a hassle on Friday. The other issue: with Otakon being in the heart of DC, the con is required to have bag searches for everyone entering the con floor. The reason why this would be an issue is due to many major Southern California conventions (especially Anime Expo) having tons of people waiting a long period of time in line because if this procedure. However, the combination of both Otakon not having the same amount of people as those California cons and the fact that the bag searches were being handled by the same ones who handled them at another DC convention, Awesome Con (with waiting time not being a problem) helped me get over this problem before the convention, and although people seem to have issues with it on Friday morning (which I could understand, given some confusion about where those con-goers with badges should line up and the fact that the Marquis entrance didn't have their bag inspection tables ready in time), the fact that I usually get in line early on Friday anyways (in hopes of scouting some possible cosplay photos) allowed me to avoid these problems. With the problems leading up to Otakon out of the way, it's time to bring up the con itself (in particular new location and layout). To begin with, let's start at the hotel that will likely be my new "go-to" hotel while the con is in DC. To be honest, the Renaissance is easily one of the better choices when it comes to hotels to stay at. While not across the street from the Convention Center like the Marquis (the main hotel associated with it), the place is a very easy walk to get to and from Otakon (you just have to cross a small block that's actually perfect for outdoor cosplay photos). The fact that it's across the street from an outdoor parking lot also makes the hotel ideal for those with larger vehicles. To top it off, you can tell that the Renaissance was looking forward to the the con attendees, as they got some help from Viz to set up the lobby with various anime items (i.e. wall scrolls, themed drinks). Then there's the area surrounding the hotel (and the convention center) and the various nearby activities that you can do Thursday. For one thing, the Renaissance is one street over from the National Mint, and as such, you can easily stop by there to pick up some proofs and uncut bills. Other nearby attractions include Chinatown, the National Portrait Gallery, and the International Spy Museum. As for entertainment, the convention center is a few blocks from the Capital One Arena (yep, they changed the Verizon Center's name two days before the con), so there's a chance that some event could be booked the night before Otakon in future years. If not, then right next to it is a mall-like building that houses a bowling alley-based bar and a movie theater, providing some additional nighttime options. If there's any complaints about the hotel, it's the basic ones that probably most hotels will have. First, there isn't much fast food joints near the area, with the closest that I know of being the McDonald's and Dunkin Donuts at the arena. The other issue is the lack of an indoor pool like the hotels in Baltimore. However, if there's one advantage that the Renaissance has, it's that it does have some ballroom space that I could see Otakon utilizing if they need more room outside of the Convention Center and Marquis in the future. Now for the convention center itself. Compared to the Baltimore Convention Center, the Washington Convention Center is huge. While the size can overwhelm some attendees (especially when it comes to looking for certain panel rooms), the Convention Center had plenty of space that would allow people to walk around, take photos, and do other things without worrying about it affecting con traffic. The additional size also meant bigger space for a number of prominent rooms (i.e. Dealers' Room, Artist Alley, Video Games). However, even with all the space in the Convention Center, there's still some places that require the convention to hold some areas in the Marquis hotel, which is just across the street. Luckily, there's an underground tunnel that connects the two buildings a la the Skywalk in Baltimore, thus making it easy to go between the two places without going outside and needing to go through another bag check. Given the location of the tunnel that was definitely beneficial for a busy Friday schedule that was already a mess due to the scheduling of the AMV Contest. As for why the AMV Contest was such a big deal for me (besides me being a traditionalist who prefers to watch the contest on Friday): remember in my Katsucon report how I was working on a video with plans to submit it various summer conventions? Well, my latest creation (a video that mixes Miss Kobayashi's Dragon Maid with the original version of Pete's Dragon) is easily my best one to date, with me finally making the finals in the Otakon AMV Contest. As such, I definitely wanted to check out the contest to see the audience reaction to the video, and with my video closing out the contest, I was able to walk in on the Saturday screening to gauge the reaction there as well (with it getting a better reaction on Saturday than Friday). As for the contest results, I knew full well that in its category, it would end up in either third or fourth place. Even if I did vote for my own video, I knew that there were two videos that would easily be the favorites in the Comedy category (with me also knowing my chances of my video finishing as a runner-up had diminished once I had an idea of what the "Best In Show" video was going to be). The first video, which I was looking forward to upon hearing about it, is basically an anime version of MasterChef, with various anime characters taking part in the cooking competition. The other video, the one that eventually won the comedy category, is a video that uses, among other anime, Saint Young Men to explain how asking "What would Jesus do?" would be a dumb idea when you consider the various feats Jesus has done in the Bible. After watching that video, I'm interested in checking out Saint Young Men myself. As for my own opinion on the results, I'm perfectly fine with it, as I can easily recognize a video that is superior to mine when I see it (with the song in the Jesus AMV being in my head following the con). Besides, along with gauging the audience reaction to my videos being a higher priority than the actual contest results, it's not like my video hasn't won anything before Otakon weekend. *When it came to Best in Show, I had a very good feeling who the winner was going to be (with me even voting for it as Best in Show): a Dragon Ball video set to "Can't Stop the Feeling" from Trolls which incorporated footage from not just all four shows, but also footage of DBZ cosplayers. Given Vegeta's hairstyle, the song would be a good fit for the series. 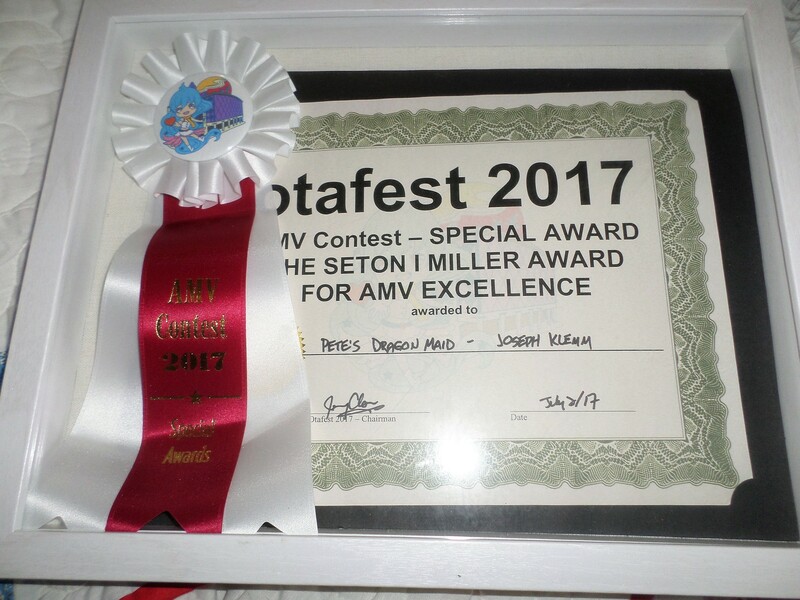 *I wasn't the only editor with a Dragon Maid AMV in the contest, as there were two other videos in the finals. The first one is a Dragon Maid version of the opening to the PBS cartoon Dragon Tales. The other one had a similar theme to my video (one that focuses on the Tohru/Kobayashi pairing). However, whereas mine was more comedic in nature, this one went with a more sentimental nature. *While on the subject of Sentimental, that and Drama were definitely hard categories to predict winners in. In Drama, while the eventual winner went to a Yuri on Ice video, I was more impressed with the artistic videos using Legend of Zelda: Breath of the Wild and Revolutionary Girl Utena. As for Sentimental, it was surprising to see a pair of KyoAni-based videos finished in first and second (the sentimental Dragon Maid video was the the runner-up, while first went to one using A Silent Voice), because I thought audiences would be more swayed by an Utena video that used a song from Steven Universe. With the AMV Contest out of the way, I could finally concentrate on the Dealers' Room at Otakon, and given what I saw this year, not only does it provide something fresh when compared to Baltimore, but also I can definitely see it growing further in the future. To begin with, the size of the Dealers' Room in the Washington Convention Center is over three times the size of the old Dealers' Room in Baltimore, which means we can definitely expect a lot more vendors here. This can already been seen in a few fresh booths that appeared at the con. Among them include an industry booth promoting the Anisong World Matsuri series of concerts (some items were tempting, but not a must buy), a booth that offered con attendees a chance to play a UFO Catcher machine for actual prizes, and a second-hand dealer that had a wide stock of video games and anime CD's (considered getting a Love Live soundtrack there, but opted to go somewhere else instead, although I did purchase a Macross figure there). Another benefit of the bigger Dealers' Room space is that it has a couple of sub-areas alongside the the the various vendors and industry booths: one decent-sized area to the side where people could sit down and eat lunch (with various convention-center manned food booths in the area) and an area that allows Otakon to follow in the footsteps of other cons by having its own display of itasha (automobiles that are painted with various anime designs). Finally, with a number of people complaining about some tables being empty (with some people not realizing the far right side of the room until later in the con), I can definitely see those spaces being filled by additional dealers as the con continues its run in Washington. As for actual purchases, along with the aforementioned Love Live soundtrack and Macross figure, the haul was rather decent. At the various industry booths that I did make purchases from, I picked up one DVD/Blu-ray from them, with me picking up JoJo's Bizarre Adventure from Viz, Shin Godzilla from Funimation (would have also picked up Speed Racer at the con if I'd known that the Collector's Edition was going to cost $300), The Big O from Sentai, and Star Fleet (a puppet show by Go Nagai) from Discotek. Meanwhile, in the manga department, I picked up the latest volume of Kin-Iro Mosaic, while my interest in import video games was met with Super Robot Wars V. Rounding out my shopping list for Otakon this year was a scale model Rally-X arcade cabinet and a plushie of Tippy from Is the Order a Rabbit. If there's one thing disappointing about the Dealers' Room this year, it isn't anything related to the dealers themselves, but rather the fact that none of the Japanese companies have taken advantage of the popularity of Miss Kobayashi's Dragon Maid, with the only items sold from that series being volumes of the manga (with me hoping to find volume 4, only to not learn until later that it wouldn't be out until September). Thankfully, the desire of getting something Dragon Maid related is easily fulfilled with Artist Alley. With the show being popular among the artists at the con (especially when it comes to Kanna), there were a number of Dragon Maid-related items on sale, ranging from prints to small pillows (with me picking up a cute double-sided one featuring the young electric dragon). As for non-Dragon Maid items, the dealer in Artist Alley that stood out was Kimchi Kawaii, which specializes in cute products that mixes animals with food items. Among their lines of products include Punny Buns, which depict bunnies as various types of buns, and Purrista Pawfee, which features cats as various items that you'd find in a coffeehouse. Kimchi Kawaii was definitely one of the busier places at Artist Alley, with a lot of their plushies selling out over the weekend (with pre-orders being taken on a few upcoming plushies, including one that has a kitty shaped like a teapot). Once you see the plushies being offered, you can definitely understand why, as a number of them are just plain adorable. Given my fondness for cuteness (especially with the plushie of a cat in a coffee cup that I bought at Anime USA a couple years ago), I knew I had to buy at least one plushie, with me picking up one of glow-in-the-dark one of that depicts a sleepy kitty as a Starbucks style cup of decaf coffee. Note to self: if the artist shows up at Anime USA, I may have to pick up at least two more plushies (one for me, another as an Xmas gift for my younger brother and his fiance). Of course, when it comes to Artist Alley, I can't talk about that without mentioning a certain incident that happened on Saturday night (which, thanks to me being on the scene and managing to take a photo, gave me something to talk about that night both at the con and on Twitter). During Otakon weekend, the DC area was hit with stormy weather on Friday and Saturday night, with the amount of rain that DC received ending up overflowing the convention center's drainage system. With that room (and the Dealers Room, although that room would be closed by the time the major downpour happened) being located underneath the drainage system, the end result was the excess water eventually pouring down into Artist Alley. The first wave happened Friday night by the art show, and while it thankfully didn't damage any of the works, it did result in the that area being closed for the night in order to clean the area up. However, things only got worse on Saturday. The storm that hit the D.C. area that night caused overflowing that resulted the excess rainwater pouring down on three different areas of Artist Alley, with a few of the booths being right underneath the area where the water was coming down from. As a result, con attendees had to leave the area once things got even messier (with a couple of people getting injured as a result of slipping accidents caused by the flooding), and Artist was closed for close to 90 minutes in order to clean up the mess and to move those booths that were near the flooding areas (including Kimchi Kawaii) to areas away from those areas to avoid any damage (or quite possibly further damage) to the merchandise being sold (although in the case of Kimchi Kawaii, most of their more sought after items were already sold out by the time this incident happened). If there's one thing to be thankful for, it's the fact the downpour areas were nowhere near the area where an artist would do his annual chalk drawing of this year's Otakon program book cover. After all, it would have been a shame to have all the rain completely ruin all that hard work. *Panel wise, I mainly stuck with a couple of industry panels (Viz and Funimation) and the Awesomely Bad Japanese Music Videos panel. Space wise, it really depends on where the panel was being held. For some rooms, it's obvious that space may be problem (with me being unable to check out a panel about subtitling done wrong because of the room getting full, while I had to sit through the last half hour of the thing that happened before Awesomely Bad Japanese Music Videos due to the room filling up quickly and people only being allowed to enter once someone else leaves the room for non-bathroom reasons). However, the panel room for the Viz and Funimation panels had plenty of room for attendees. Heck, to give you an example of how much space the room had (and how predictable the pacing of a certain company's panel has gotten), during the Funimation panel, once I learned that they finally got some copies of Shin Godzilla at their booth (they weren't available on Friday, otherwise I would have bought it in between getting my con shirt and heading to the AMV Contest), I left the panel temporarily to pick up my copy of the film (out of concern that it could sell out before I had a chance to pick it up after the panel), and once I got back to the room, not only was I able to find a seat rather easily, but I didn't any major pieces of news in the progress. *Real life wise, things have been a mess for me. A couple of weeks before the con, while watching the Crunchyroll marathon on Twitch (in particular, Miss Kobayashi's Dragon Maid, as I wanted to see Twitch's reaction to Kanna), a filling fell out of one of my teeth, with my mother deciding that it's better than I got the crown treatment instead of replacing the filling. As such, I've spent Otakon with a temporary crown and had to avoid eating certain foods (while also having some stuff on me in case the temp fell during the con). Meanwhile, hours after returning from the con, while trying to watch Ponies: The Anthology VI, I noticed some screen damage on my laptop, with attempts to fix it via various programs not completely working (and that's after I left the screen on for at least a couple of hours). As such, I ended up buying a new laptop. While money isn't a problem (I still had loads after the con, including some that I specifically don't mark in my bank book as "emergency/big purchase funds", not to mention the laptop was only $400 with protection plan), I do feel disappointed in having to get a new one, as outside of the damaged screen, the laptop I've been using these past years worked rather well once I got rid of the Windows 8 OS system that it originally ran on. *While on the subject of Ponies: The Anthology VI, BronyCon (where this MEP premiered) happened at Otakon's old stomping grounds the same weekend as Otakon. Con attendance dropped for said con, which I do feel is a due to a combination of both Otakon happening the same weekend and interest in My Little Pony slowly dropping (the fact that the new episode of the show that aired that weekend viciously bashed the show's adult fans won't be helping things either). Up next is Anime USA in December, and with the a busy period ahead of me in terms of gaming, it's probably a good thing Anime USA is happening later this year. As usual, I conclude my report with cosplay photos that I took while at the con.